It is about pace and movement, a persistent forward motion; the camera, the music, the relentless time that ticks beneath its characters’ frenetic iniquities. And then, quite consequently, it is about stasis; a spiritual, cultural, generational and intellectual immobility that comes from being unaware and unmotivated and under-the-gun. These are the two elements of my favorite film, The Graduate, which is now a half century old. It is, I believe, as flawless a work of art as I have absorbed for now 35 of those years. Long before I could grasp the more detailed elements of all that immobility in motion, it shook me to the core. It never fails at this, even today. I see The Graduate reflected in the eyes and sounds and actions of those kids from Parkland High School and their generation that follow them into the streets and ask questions of why the world they enter is the way it is and what they can do to change it. On the very surface, The Graduate is a dark comedy about a lost college graduate track star, Benjamin Braddock, whose future (to him) looks bleak and meaningless. To everyone else, including his doting and ultra-materialistic parents and their mostly distracted upper-middle class friends, he is a track star with a cool car and a bright future laid out before him; grad school, privilege and bachelor eligibility. Only one person seems to see Benjamin’s doom-struck vulnerability; the seductive villainess, Mrs. Robinson, a long-time family best friend. Trapped in a loveless marriage, she leads the confused and gullible collegiate into a summer affair that ends abruptly when the two families coerce Benjamin to take out her daughter, Elaine Robinson, so beautiful, so innocent, who Benjamin falls almost instantaneously in love with because she is as skeptical of the same death-sentence world for which they are both working diligently to join against their will. This dynamic, which will turn recalcitrant boredom into romantic obsession and eventually a generational outcry would become cinema history. But at its core, and what makes The Graduate a lasting work of American art, is the brilliantly creative way it captures the sometime involuntary transitions our lives can take from ambition into disillusionment into rebellion into reluctant acceptance and eventually settling into a kind of fantasy about intransigent retreat…but does it? Like all great works of art, The Graduate asks its audience to decide on its message, its morality, its conclusions. It provokes independent thought – imagine that – and it is that creative leap that has captivated audiences, and me, for generations. Late last year a book titled Seduced by Mrs. Robinson – How the Graduate Became the Touchtone of a Generation crossed my path and of course I needed to immediately read it and speak to its author, Beverly Gray, who holds a PhD in American Literature at UCLA. Reflecting its themes, the film’s production may have shown the way of independence, but its perfection is miraculous when considering the relative neophyte stage of those who created it: Produced by a B-Movie hustler, Lawrence Turman, and directed by second-timer, Mike Nichols, whom I eulogized in this paper upon his passing in 2014, and written by a TV comedy writer, Buck Henry, who would take its inspiration from a first novel by Charles Webb, while introducing relative unknown young actors, Dustin Hoffman (Benjamin Braddock) and Kathrine Ross (Elaine Robinson), and a stage actor, Anne Bancroft (Mrs. Robinson). These are artists discovering the craft. To conquer it so completely is a stunning achievement. When considering its juxtaposition of movement and immobility, it is a work of seditious art reflective of America’s 1960s edicts; social, sexual, economic upheavals, yet it is relevant in these times dominated by a youth culture spanning the globe with technology and invention, simultaneously crippled and liberated by both. The greatest gift may be that The Graduate is a visual (wonderfully shot and edited), literary (beautifully scripted and executed) and aural (sublimely prescient songs by Simon and Garfunkel) tale told for then and now; human nature stripped bare and placed before us in startling genuineness. 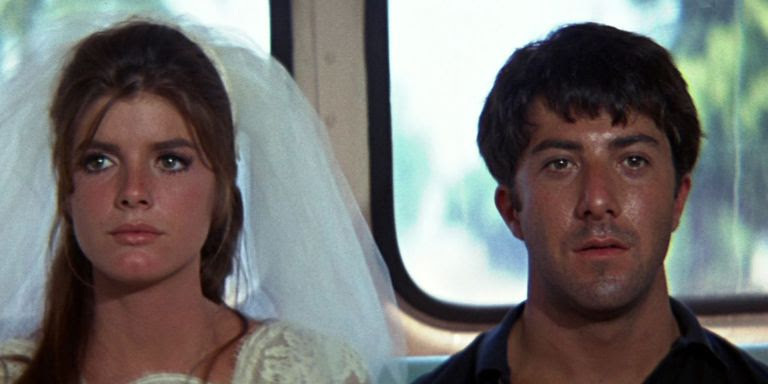 Ultimately, The Graduate is a cyclical marvel; it begins with a confused and isolated man in a conveyance seat; an airplane, and ends with that same man, confused and isolated, this time with as equally confused and isolated woman, sitting in a conveyance seat; a bus. He is moving, but sitting. His journey, the movie, and thus your experience begins and ends in the same place; like life and death and love happiness and all the things that matter in life – beginnings and endings, all the same. And that, as stated, is the lasting charm of The Graduate…who knows? It is a story of searching for meaning where, ultimately, there is none. The promise of youth as a con. The glimpse of what ignoring the frightening vagaries of a future looks like when in the hands of a knee-jerk reactionary, who, in very Zen-like fashion, lives entirely within the moment coddled by a relentless id decrying any hint at convention. This is cat-nip for the young and a specter of destruction for the rest who need youth to perpetuate the nonsensical treadmill of society. And in a very real way The Graduate is a warning to those who attempt to change the world against the tide of societal norms. The natural revolt of youth, as it was on March for Our Lives Day last week, is brimming with a sense that where they live, where they are asked to grow and thrive and realize their dreams is not how they wish it be. And that is okay. It is more than okay. It is a celebration of youth. But at the same time there is the reality that change is impermanent and that what they hold dear will too be challenged in time. The bus keeps going, but we are sometimes left sitting in it thinking we are breaking free, but we’re still, well…sitting. For her part, having spent the time and energy writing about a film that has moved her for decades, something I am well-aware of in my authorial pursuits, Beverly Gray is most complimented when people read her book and want to revisit the The Graduate again and perhaps enhance their feelings about it. The Graduate is a work of art that today inspires me as much as it did when I was balefully looking out at a world not of my making that I had to face – change or no change. No matter where that bus was going for me, it was at least moving forward.